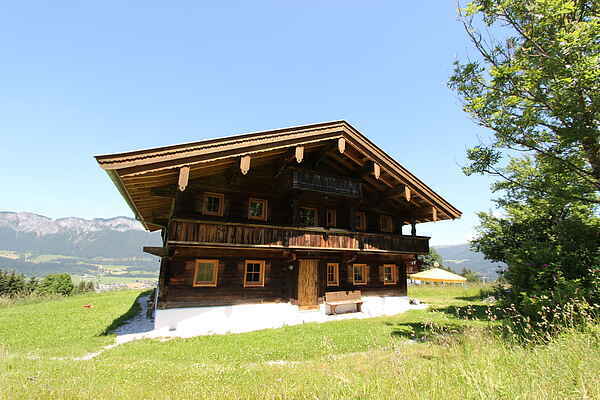 This beautiful and unique property, situated directly on the slope in St. Johanns in Tyrol, is ideal for families, groups and small clubs that want to spend unforgettable holidays in Tyrol. The house was built about 300 years ago, and in 2015 it was completely renovated and upgraded to the latest state of technology. The rooms are generously furnished and the smell of natural fragrant pine accompanies you in the most agreeable way. This property is a successful blend of old and new styles without compromising the comfort. On the ground floor you'll find the kitchen, living room with a sofa bed, a restroom and a single bedroom. The upper floor features a bathroom with a tub and three double bedrooms. The winter turns this property into a real gem. The ski slope runs directly past the house on both sides. Therefore, it more than lives up to the rating as ski-in/ski-out. Lifts are only a stone's throw away and right around the corner you'll find an umbrella bar. Walking there takes less than a minute. In the summer, the property also entices guests with a huge array of attractions in the surrounding area. The mountain railways also run during the summer's peak travel period. Aside from endless hiking trails and mountain bike routes right on your doorstep, the immediate vicinity offers a climbing park and a mountain cart track. Important: At your arrival bring along food for at least two days. Please call us about one hour before your planned arrival at +436766269301. The accommodation will be available from 15:00. In case your arrival will be after 19:00 please let us know in advance! We look forward to your arrival and wish you a safe journey!